Place the milk, vanilla extract and cinnamon stick in a medium saucepan and bring to barely a simmer over medium heat. Once it begins to bubble and simmer around the edges, reduce the heat to the lowest possible setting and simmer for 5 more minutes. Remove from the heat and set aside to cool. Once cool, remove the cinnamon stick. Place the chocolate in the top part of a double boiler, or in a metal bowl set over a saucepan filled with 1 inch of water. Make sure that the bottom of the bowl is not touching the water. Bring the water to a simmer and melt the chocolate. Stir with a rubber spatula to make sure all of the chocolate is evenly melted. In a medium bowl, using a whisk or fork, combine the egg yolks, sugar, and salt and whisk or beat until thickened and the color has gone from bright to pale yellow, about 1 minute (or count 60 Mississippi’s at your own leisure). Slowly whisk in the melted chocolate and combine thoroughly. A ladleful at a time, whisk in the cooled milk. Fill a baking dish or roasting pan, large enough to accommodate ten 6-ounce ramekins or flan or custard molds, with ½-inch of hot water. Place the molds in the water bath. Using a ladle, carefully fill the molds with the custard up to about ¼-inch below the rims. Carefully place the baking dish in the oven and bake for 40 minutes, or until the custard has begun to set. The top layer should be thick and resemble the top of a brownie. It should not be browned, although there can be a few small spots here and there. Very carefully remove the pan from the oven and the ramekins from the water bath. The jericalla will jiggle and will look a bit runny under the thickened tops, like a thin pudding. They will thicken as they cool. Serve at room temperature, or once cool, chill in the refrigerator and serve cold. 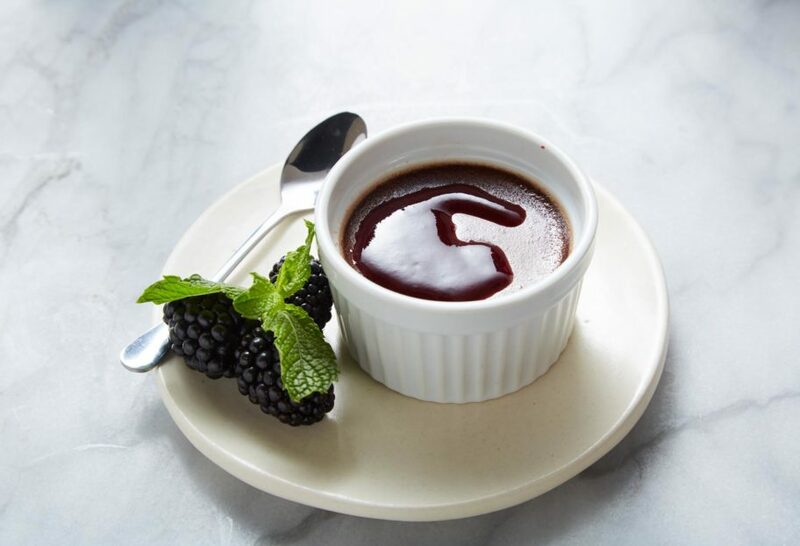 Serve with Blackberry, Mint and Lime Coulis if you desire. Variation: Some Mexican cooks brown or caramelize the top layer of their jericallas by briefly running them under a broiler (I prefer a top layer that thickens as it bakes but doesn’t brown). If you want the darker caramelized topping, place the custards under the broiler for 30 seconds after they have cooled. I served this today chilled and with the coulis. The addition of coulis upgrades this recipe and I’m comfortable with serving this one to my guests. It’s very nice, thank you Pati. I was wondering what kind/brand of vanilla you use? Hola Pati ! Do you think this recipe would work with a non dairy milk? Oh give it a try, Jasmine. It would be a 1:1 substitute…and let me know how it goes! I just watched this on your episode today! I remember watching one of your past episodes when you made the vanilla jericalla, and I loved that recipe a lot that I was about to comment and ask if you could make a version with chocolate (considering how much I love chocolate, haha). Now I have TWO new desserts to try making! Yay! Enjoy both the chocolate and vanilla, Carlos.